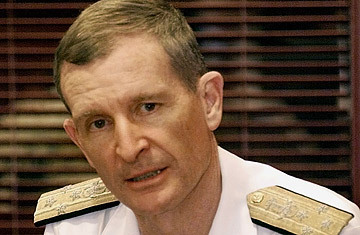 Retired admiral and former commander of the U.S. Pacific Command, Dennis Blair, speaks during a news conference in Jakarta, Indonesia. The downsides to Blair's appointment are that there's little chance he'll lead the much-needed charge to streamline the intelligence community. As the former commander of the Pacific Fleet, Blair had a vast and sprawling staff that makes the bloated intelligence community seem downright efficient. Then there's also the fact that, like most military officers, Blair is a believer in tactical intelligence. Let me explain why that's problematic: During the last Gulf war, the Pentagon badgered the CIA for things like sand samples and stress limits of Iraq bridges, the terrain its Abrams tanks would roll across. Yes, that information was nice to have, but such requests diverted CIA resources from strategic intelligence. Rather than answering the question of whether Saddam had kept his weapons of mass destruction, the CIA sent its clandestine sources into Iraq with baggies and little plastic shovels. On top of it, the two wars in Iraq and Afghanistan have diminished the role of the CIA. It's the military in those two countries that collects the body of intelligence. Pragmatically, it couldn't have been otherwise. A lieutenant leading a patrol through an Iraqi village is much more likely to collect relevant information than a CIA officer confined to an office. Whatever Blair's personal biases and inclinations are, as long as the U.S. remains in Iraq and Afghanistan, fighting two wars that have neither been won nor lost, he will have no choice but defer to the Pentagon. You can't fight over money and people in the middle of hot wars. If the Pentagon says it needs sand samples, that's what the intelligence community has to go out and get. Leaving Robert Gates at the Pentagon and appointing Blair as DNI is a pretty clear sign that Obama intends to live with the national security status quo. Obama knows all too well that intelligence reform is the third rail of American politics, one he does not intend to touch as long the country teeters on the edge of depression.